We stayed at The Altos for a family wedding. The staff without exception are fantastic. Nothing was too much trouble . Fortunately they all spoke English but were also encouraging and helpful when we attempted French. The rooms are clean modern and comfortable and are refreshed daily. Buffet breakfast was very good. A very friendly environment. The town is just a stroll and we found the locals welcoming and friendly. You can see Mont St Michel from the town as it is so close. This is a very lovely hotel in a very lovely town. Try it! We stayed at this hotel for one night only, but it was an enjoyable stay. The staff and owner were extremely helpful and very friendly. Our room was of a good size and the bed was very comfortable. The room was modern nicely decorated and very clean. We opted for the breakfast as there was not to much around this hotel as it is on the Main Street going into Avranches. There is secure parking at the back of the property. The hotel was a great location for us as we mainly wanted to visit Mont St Michel which was only about a 20 minuted drive to. We would happily stay here again. I stayed at the Altos hotel for 5 nights in July 2004 and enjoyed every minute I was there. It was peaceful ,clean and well decorated, The staff and owner were very friendly and helpful. They always found time to converse. The room I had was excellent comfortable bed and modern clean bathroom. My room was clean and beds made daily with fresh towels and toiletries each day. Every morning there was a lovely buffet breakfast with a member of staff to greet you with a smile. Parking is good and secure. The hotel is situated just 5 minutes walk from town centre. Its a nice walk to town and some interesting shops to see. There are a few nice restaurants and bars. I came across some beautiful gardens and an old ancient castle which is free to use. When you get to the top you have a magnificent view across the rooftops of the town. There are three large supermarkets about 10 minutes walk from the hotel if you need anything. There is also a service station nearby. The history of world war 2 is apparent and interesting. St Mont Michel is a short drive away and St Malo is about 45 minutes away by car. Both locations are an easy route to use. This hotel has to be the best I have stayed at . I give it 5 stars any day for its 110% satisfaction, quality and cleanliness. Its the place you will want to return to I am sure. After 2 weeks touring Normandy by bicycle, this was the perfect hotel for a 2-day layover while day-tripping to Mont S.-Michel. Number one-reason: elevator! Second reason: doorways wide enough and rooms big enough to accommodate our bike friday trailer/travel cases. Free bike parking in secure outdoor area. No other hotel we stayed at in Normandy had all these features. N.B. : If you arrive on Sunday, be sure to have a cell phone handy to call the owner to check in before 5 p.m. The place is dark and locked for then. This was a one night stay on the way back to the tunnel from Jersey and perfectly acceptable. Good sized room and separate toilet/shower. Clean. Parking easy and safe, easy to find just off the motorway. Staff friendly, good continental breakfast. A little expensive for what it is, but good enough. The room are much bigger than on picture, extremelly clean and the decor is very nice , we also enjoyed the duvet and high quality beds, we enjoyed it so much that we almost missed the breakfast, which was again fantatstic and amazing value for money. We extended our stay for an extra night. I would definitely recomment this 2 stars hotel which could easilly be a 3 to 4 stars. A huge thanks to the hotel Altos team. 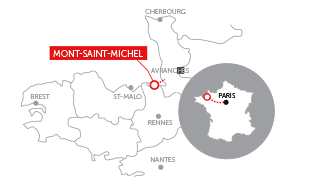 We chose this hotel because of its location; it is 500 metres from the cathedral of Avranches and perfect for a visit to the Mount st Michel. The bedroom was large and very clean. The parking was safe and we could park there easily. The staff was friendly and the owner of the hotel was very helpful as he helped us solve a problem with a rented car. He made several phone calls on our behalf and made it possible to solve everything at our content. We would choose this hotel again, it offers more than just a place to stay.